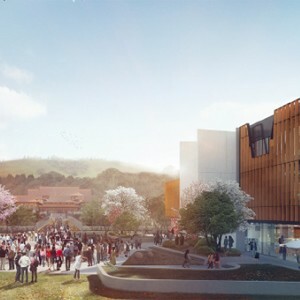 Woods Bagot has called on the teachings of Buddhism to inform their design of an $18 million project in the Wollongong suburb of Berkeley, NSW. The new Nan Tien Bridge and Plaza designs are the collaborative work of Woods Bagot and the precinct’s institute with the key deliverable of a pedestrian link between the Nan Tien Buddhist Temple and the Institute and Cultural centre. The project will span over 4,600sqm and will provide kiosk and retail facilities as well as a landscaped bridge that will form a user-friendly passage between the temple and institute. “The precinct will be alive with students, teachers, visitors and tourists alike. This bridge and plaza links the temple, institute and pagoda in a scheme designed to create a human-scale fabric for community gathering,” says Georgia Singleton, from Woods Bagot. The firm says the design is inspired by the Buddhist philosophy, highlighting the green space along the length of the bridge as symbolic of Buddhism’s strong connection with the environment. “The architecture is influenced by the principles of Buddhist teachings, made manifest in a living green, land bridge design,” says Woods Bagot Design Leader Alan J Duffy. The design is a cultivation of Humanistic Buddhism says the firm, a reference which also informed their design of the precinct’s 6000sqm University and cultural centre in 2013.